A few months ago life as we knew it changed forever when I allowed Bryson to check out a Star Wars movie from the library. I grew up in a home with four brothers, so naturally I became exposed to the Star Wars phenomena but always considered them nerdy boy movies and never took the time to watch them. However, now that I'm a mother to a 4-year-old little boy, I felt it was my duty as a good mom to see what Star Wars was all about, so Bryson and I set a goal to watch all six Star Wars episodes in sequential order. Watching all six movies took us a few weeks, but we got through them and now Bryson is completely obsessed and I have to admit I am as well! Star Wars is AWESOME and so symbolic! Who knew?!? 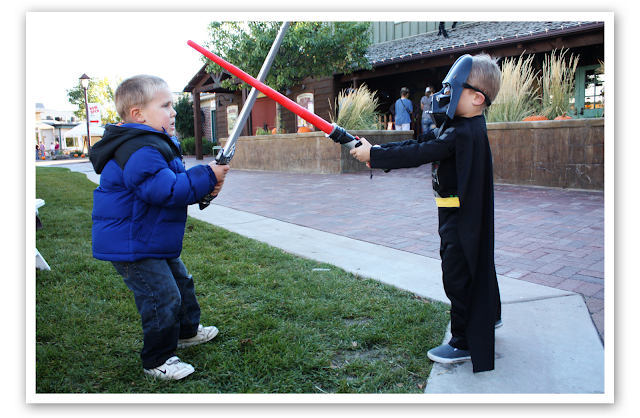 Bryson is a very active movie watcher and likes to re-enact all the fight scenes as he watches them by jumping off the couch and rolling around on the ground with his light saber while making sound effects. I've learned it's very wise to stay clear of the front of his mouth as he makes his sounds effects because his spit trajectory is extremely wide-spread and has the tendency to drench everything in its path very quickly. So while he drenched the room with his re-enactments as we watched, I couldn't help but pull out my notebook and take notes (I'm nerdy like that) on all of the religious comparisons packed into each episode. Star Wars has opened up such an amazing way for me to teach Bryson about the Gospel and he actually listens and gets it! 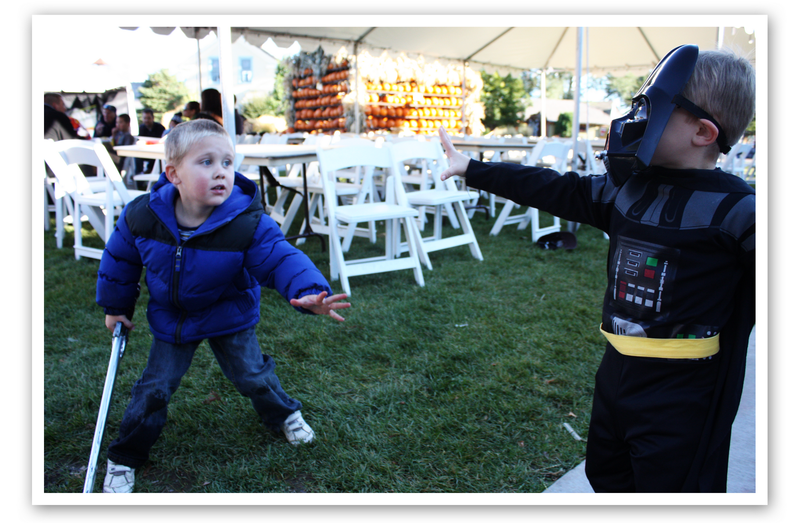 So naturally for Halloween Bryson chose to be Darth Vader. We bought his costume a few weeks ago and he's pretty much worn it everyday since. Thanks to Bryson's Star Wars obsession I've become one of the best light saber fighting mama's this side of the Jordan River. Bryson says he taught me everything I know, but I beg to differ (he doesn't know this, but I also took notes on the fight scenes...hehe!). I love this commercial because it is EXACTLY how Bryson walks around everyday. 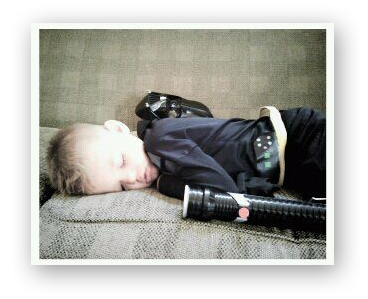 I love my little Darth Vader.